It is no secret that I am a happymail enthusiast. I thoroughly enjoy allowing my imagination to go wild creating and exchanging thoughtful handmade paraphernalia with my closest mail art friends. My favorite part, now that I have found people who I connect with very well is the way that we feed off of each other’s creativity. 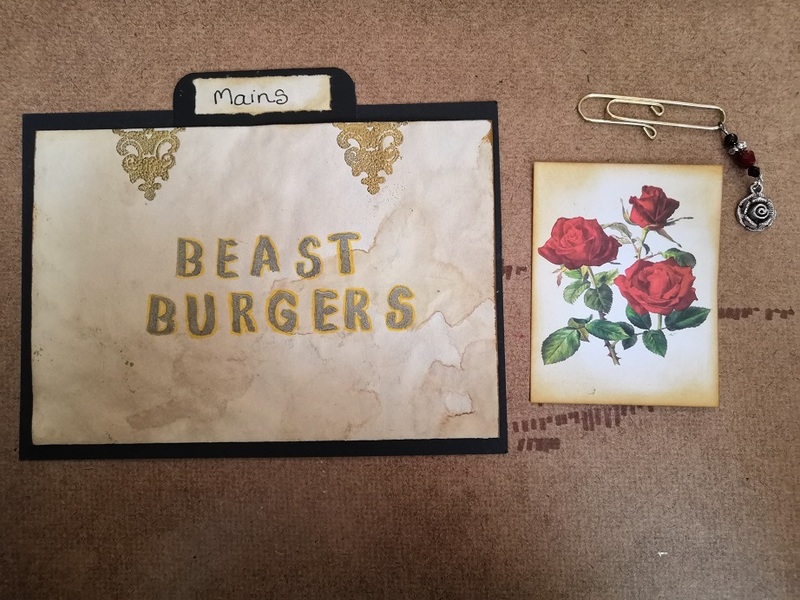 A couple of months ago I had an idea for a swap centred around recipe cards, and my friend, who I’ve been doing mail art exchanges with for a couple of years now was excited to give it a try. The only rule I laid out for this challenge was that we each did a set of three recipe cards 1 main course, one side dish or starter and 1 dessert. I absolutely love what we both created (hers more than mine) and below I’ve shared a few photos of both our sets of cards as well as some background and details in the hope that more people might be inspired try this out in the future as it was a lot of fun and there are truly endless creative possibilities. Happymail means different things to different people. Some are happy just writing a letter, or sending a postcard. Some trade purely store bought pieces of crafting paraphernalia or tea and there is nothing wrong with that. I am a huge fan of doing that too actually, especially across countries where we don’t have access to the same materials! But having said that, I am delighted that my journey has led me to such talented people who I regularly collaborate and trade projects with. People who have in time become some of my closest friends. We exchange ideas and inspire each other to try new things all the time. This also extends to the digital world with 3D printing. Gorgeous, bizarre, amazing and fun things happen when we put our heads together. The idea for recipe cards began forming when I was going through some gifts that my husband and I had been given for our wedding, many moons ago. A guest had taken the time to put together some recipes in a photo album for us and I though that was such a beautiful and thoughtful thing to do. Hand picked recipes are an oddly precious and unusual sort of treasure. It got me thinking, a recipe is a sort of piece of art in itself so what about combining that with some sort of embellishing to create a piece that is more interesting to look at. That is pretty much the end of my thought process regarding the start of it, so the next part was finding someone who wanted to give it a go with me, then getting stuck in and seeing what came out. My swap partner does not eat meat, so I had to think of recipes that were vegetarian friendly. 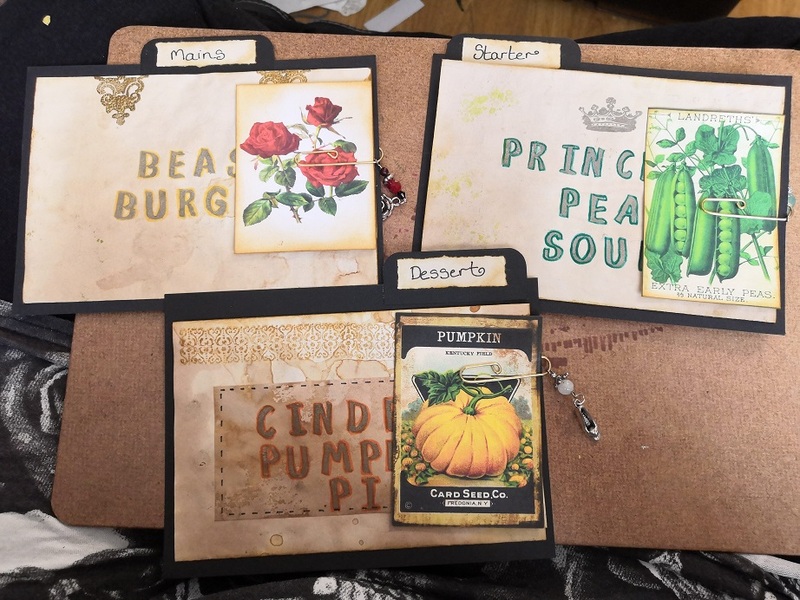 Without really having a picture in my head for how the cards would turn out, I ended up focused on the recipes and the meaningfulness behind them. 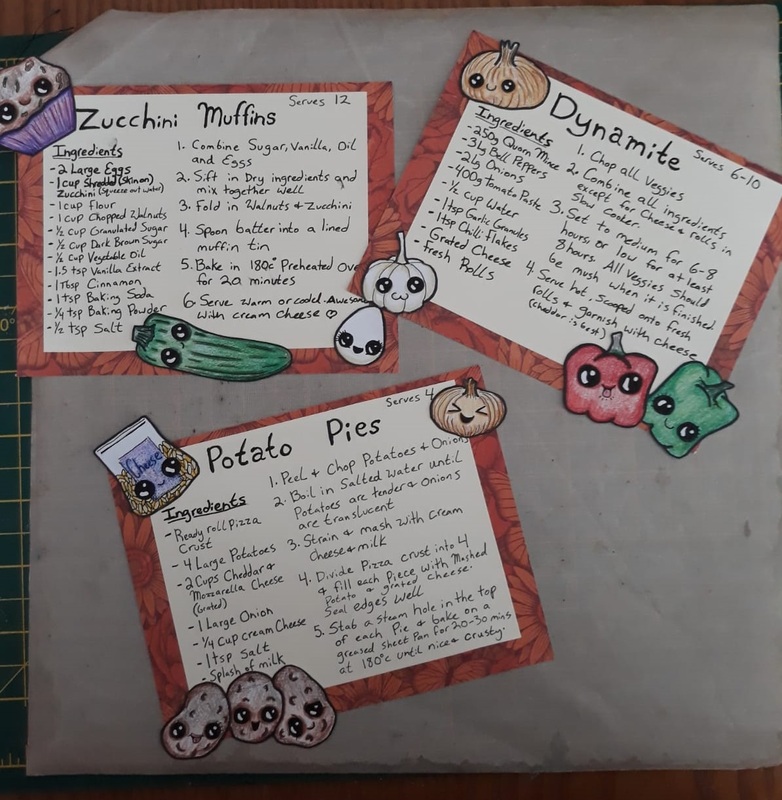 When it came to the visual side I got hung up on how to get my recipe squashed into a small space, then I tried to dress them up and make them cute with some kawaii hand drawn foods. At the time I was a bit stuck, but in hindsight, there are a lot of other things I could have done. I look forward to another opportunity to try again! The recipes themselves are all comfort foods that are special to me from my childhood and I explained that in an accompanying letter. There were also various food themed bits and pieces in the box I sent it in, so I tried to tie it all together in a sort of happy mail, food themed packet. Random is not my middle name… but often I think that it probably should be. I was really pleased with how cute the cards came out, and my friend loved them, but what she did with hers really blew mine out of the water! On her end, a random wave of inspiration (coupled with insomnia) resulted in something extra special. She went with a fairy tale theme and each recipe represents a well known story. She used a variety of techniques to decorate the cards on every single surface. 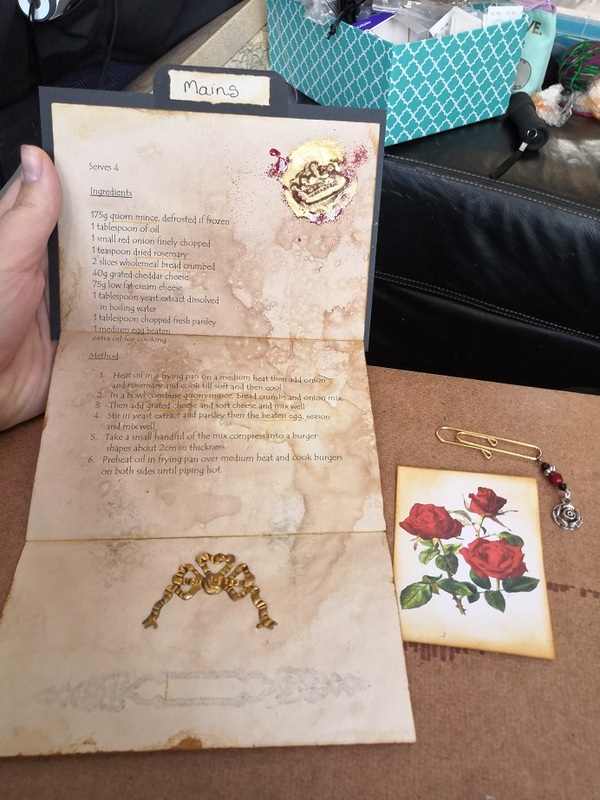 They fold out to accommodate each recipe without needing to be squashed, and she even made a gorgeous themed charm on a clip to hold each one closed. Then, to tie everything together even more than the clear theme she was following, she wrote a whole back story about all three recipes! She has certainly inspired me to push it further next time, and I’m beyond delighted to have these beautiful and thoughtful cards in my collection of mail art pieces. I still have so much to learn in terms of paper craft. I try many different things and I’m really good at giving the impression that I know what I’m doing, but in all honesty, It doesn’t come naturally at all. I’m always learning and rely quite heavily on the fact that I can draw.